No, there is nothing wrong with wooden gifts. Just making a joke about the old “Don’t take any wooden nickles” saying. The traditional five-year anniversary gift is wood. Ben is tricky to buy for, especially when it comes to wooden gifts. He already has wood working tools, and the one he wants is about $1000, so that wasn’t happening. 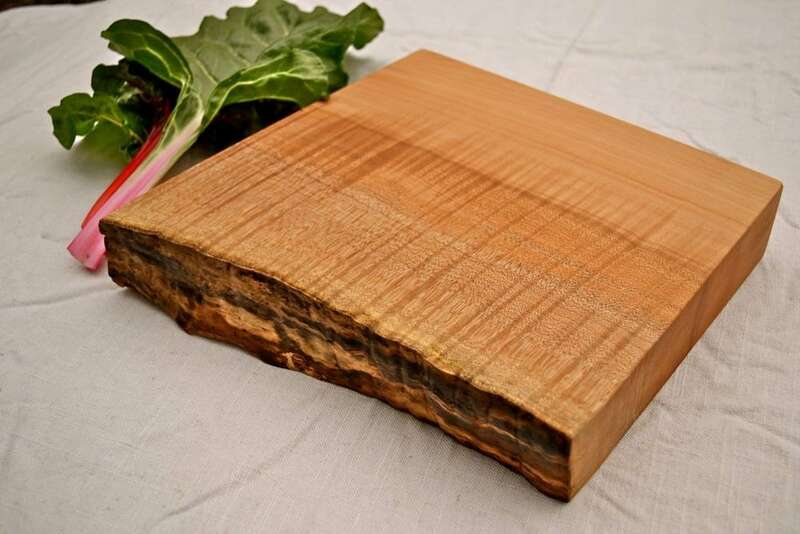 I considered a nice wooden cutting board like this from Red Onion Woodworks but that seemed a little too utilitarian and not so romantic. I switched gears and started thinking of art ideas. We always need art, right? 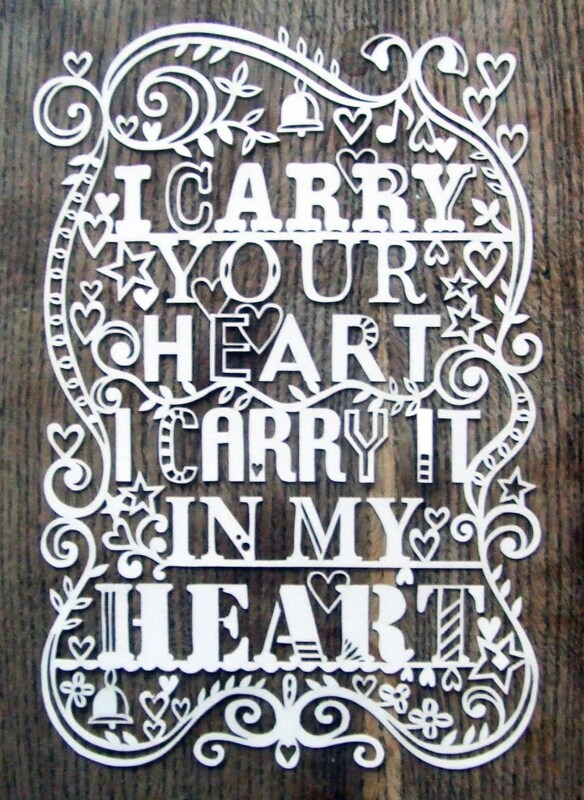 A quick search on Pinterest yielded a few results, like this sweet cut out. I’ve actually seen Julene’s amazing work before on her site and love the attention to detail. Seriously, check out these custom pieces. Pretty fantastic, huh. Well, luckily, Julene has an Etsy shop to sell limited edition laser cuts. I thought this listing was adorable. But, it isn’t wood, is it? Well, a wooden frame can fix that in a hurry. Ben thought it was cute, too. I thought about wrapping it in a faux bois paper, but ran out of time. Oh, and, I could always swap out the backing for a piece of stained wood veneer. I recently created a custom Family Tree cut out with a wood veneer backing. I think it’s fabulous. That’s the 411 on our anniversary gift giving. Ben gave me a dinner to our favorite restaurant, sans kids. That rarely happens. Do you give traditional wedding gifts? If so, what creative year gifts have you come up with? Year six is iron. That could be tough. Happy Anniversary! I featured Julene before too, she’s got some amazing work! I LOVE that laser cut! We had that poem read at our wedding so I’ve been thinking about buying it for my husband for our anniversary. 🙂 Your idea of backing it with a piece of wood veneer is fantastic! Happy Anniversary! My husband and I just celebrated our’s too and I had a hard time with this one – opted to use it as an excuse to buy a bench for our front porch. Iron next year, really? That is going to be difficult! Good call on the laser cut – it looks great. Kati, Good call on the bench! I’ve seen people do something travel related each year, so they may go to Muir Woods or something for year 5. Yeah, doesn’t iron seem like a doozie? Oddly enough the other option for traditional is candy. Really, after six years I’ve only earned candy?!?! Hmm. Kim, you *might* not want to ask your hubs to pick out jeans for you. I know I wouldn’t want Ben to. Maybe nice sheets? My husband and I don’t do traditional wedding gifts but his mom uses gets us a traditional gift! We don’t really do traditional gifts. Heck, we barely do gifts at all. We went to a football game for our first anniversary (and we had just bought our house), for two year we bought the CJ-7, and who knows what we’ll do for three years. When you come to MN you must help me pick out/create art for our entire home, you have a gift! And that FAMILY cutout with the wood veneer backing is AAAAAHHHMAZING! We planted trees in the yard of our new home on our 5th anniversary! Love your blog! You were more clever than you realized … paper is MADE from wood!